Last year, Johnsonville created a limited run of t-shirts using a member's (employee named Shawn) tagline, “You Can’t Spell SaUSAge Without ‘USA’” written across the chest. The shirts were a huge hit on the brand’s social channels, garnering a surprising level of positive sentiment. This led us to the insight that consumers might be compelled to hear the story of Johnsonville’s All American origins and that the “Made in the USA” claim not only built trust and quality associations, but improved purchase intent as well. 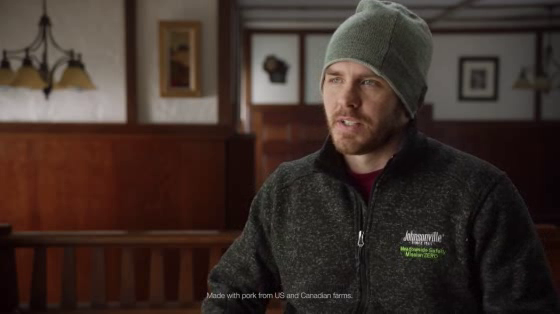 This insight led us to a simple campaign premise: this summer, let’s remind America that “Johnsonville brats are made in the U.S.A.!” This summer, Johnsonville not only wanted to kick off grilling season with bang, they wanted every American to know that Johnsonville brats are made right here in the USA. So for the third installment of the “Made the Johnsonville Way” campaign, Johnsonville once again turned to its employees for the commercial ideas. This time around, four-year Johnsonville employee, Tammy, had her all-American commercial dream come true. After all, you can’t spell SaUSAge without U-S-A!